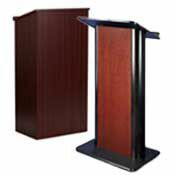 Addressing a large audience while standing at a podium on the floor or sitting at a tabletop lectern to give a presentation is less stressful than without a lectern or podium. They’re great for holding your notes and as something for you to hold onto. 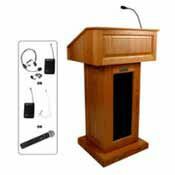 Although a lectern or podium will not overcome everyone’s fear of public speaking, it will help. 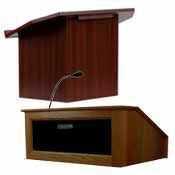 Tabletop Lecterns, Floor Lecterns, and Speaker/Mic Lecterns.